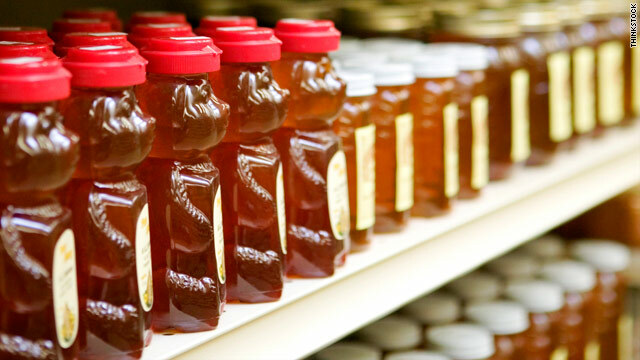 Testing conducted by Food Safety News finds that most honey sold in retail stores in the US isn't "honey". Note: If you're reading this and are not yet a member of Peak Prosperity's Beekeeping Group, please consider joining it now. It's where our active community of bee enthusiasts share information, insights and knowledgable daily discussion to help each other support and nuture the pollinators our food supply is so dependent on. Simply go here and click the "Join Today" button. While I am no longer surprised by the adulterating, faking, poisoning and contaminating of the food supply by entities trying to make food growing and processing into a manufacturing activity that makes money, I do find myself more and more irritated, angered, frustrated and furious that it continues and that people, at least in America, can't seem to stop buying food from the grocery store. Apparently death by slow poison is easier than growing your own food, buying from local producers and exchanging with neighbors doing the same. My grandmother, who ate her honey every morning on a big homemade biscuit with homemade sausage would be horrified by the latest example of food system contamination. And my grandfather would be ranting as much as I have over this the last few days. Good gracious, what will it take for people to stop supporting this madness! Are you still using Langstroths or did you go top bar? PCC had a long article about this a few months ago. I had no idea! Shopping at the natural market is expensive but FOOD is expensive! Real food at least. It seems to be another way to hide inflation. In order to keep the cost of honey down we must be sold something that isn't honey? No thanks. I'd rather have less money and more health. Looked in the kitchen, and sure enough, two of those offending jars were right there on the shelf. One trip to the weekly neighborhood market and there were three different honey makers right there. So I got the honey from just a few miles from my house (bartlet pear) even though that tupelo honey was mighty tempting. I have learned a lesson in all of this. There is a bee-keeper's supply store an hour's drive from my place. They sell supplies and products of the hive. Part of my overall preparations were to buy a couple of 5 gallon buckets of locally produced honey. As long as you keep moisture from it, it never spoils. It has crystallized completely (as far as I can tell without opening it. Tipping it on its side for a few hours and it rolls as uniformly as it did before tipping it.) If it weren't pure, it wouldn't crystallize. It always bothers me that the cutesy plastic bear bottled honey flows like thick syrup. Perhaps, it is just thickened syrup with a dash of honey added as a flavoring agent. I can't remember seeing any of them ever having a hint of crystals. 10 days ago caught a swarm. Put 'em in a 5 deep frame nuc box the frames are wedge type where ive broken the wedge out reinserted at 90 degrees and stapled in place, this is to give bees encouragement to draw straight comb and have strong attachment. last eve. i went to move them into a permanent 8 frame langstroth deep. the frames in the nuc all had 50% or more comb alreadydrawn heavy with flow and several of them broke loose and made quite a mess. had they been on foundation none of this would have happened. I also noticed that farmer collected or real honey crystalizes in a couple of months. The other stuff stays the same for a longer period of time. You can still scoop out what you need with a spoon and it will melt down again. To make a honey mustard vinegar salad dressing, I scooped out a tablespoon of completely crystalized honey into a warm bowl and it slowly metlind down again.